Without a doubt, female participation within the sports industry has increased dramatically in recent years. Fans see more and more female representation across almost every league, from the Olympics to the WNBA. The question is, why? Given this move towards female athleticism, why isn’t America’s most relevant league integrating women into their sport? Specifically, why hasn’t the NFL created the WNFL yet? While I don’t necessarily have an answer, here are the three most important reasons why the NFL should eventually institute a WNFL. When the idea of a women’s professional basketball league first circulated, it was met with much of the skepticism that a women’s football league would receive today. Yet, in 1996, the impossible became possible, and the WNBA was formed. Today, even though the relevance of the WNBA is still hotly debated, one thing cannot be disputed: The league allows talented women to have an outlet for their professional-level skills. In 1992, Team USA’s Olympic women’s basketball team started a literal gold standard that would spark the 1996 creation of the WNBA. In fact, their gold-winning streak is still unbroken over 20 years later in 2017. Geno Auriemma (@GenoAjustsayin), the head coach of the 2016 Rio team, says that the reason for the success is the players’ experiences in college and even professional league basketball. This success isn’t entirely without reward, as from 2014 to 2015, the year before the latest basketball Olympic season, fandom numbers jumped from 19,527 fans to 23,119 fans (SBRnet). Even though growth with fans is slow going for the moment, the WNBA fills a need in the world of sports and offers a model of what a women’s professional league can do for a sport. What if the WNFL could do the same for the world of football? It might sound absurd now, but remember, the WNBA also sounded that way before it came into fruition. Even though football is currently considered a “man’s sport,” that certainly doesn’t stop women from watching it. In fact, the women who consider themselves fans of football are more consistent than men. Both college football and the NFL grew in total fandom size from 2014 to 2015 but dropped in 2016. Everything from political controversy to changes in team rosters could have caused the decrease, but what’s most important to note is the rate at which men and women withdrew their fandom. The table above shows the makeup and size of the NFL’s fanbase over the past three years. Though all groups grew in interest from 2014 to 2015, the 2016 decrease is intriguing. 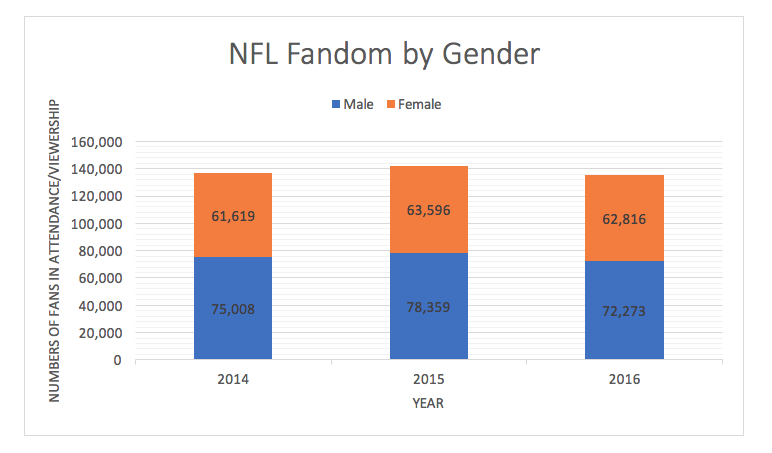 While women’s fandom only decreased in number by 1%, that of males decreased a whole 8%, dropping their fandom lower than it was two years prior in 2014. If that doesn’t seem shocking, look at the graph below. College football fandom follows a similar trend, but the difference is starker. While women’s fandom once again only decreased in number by 1%, men’s fandom decreased by a whopping 11%. 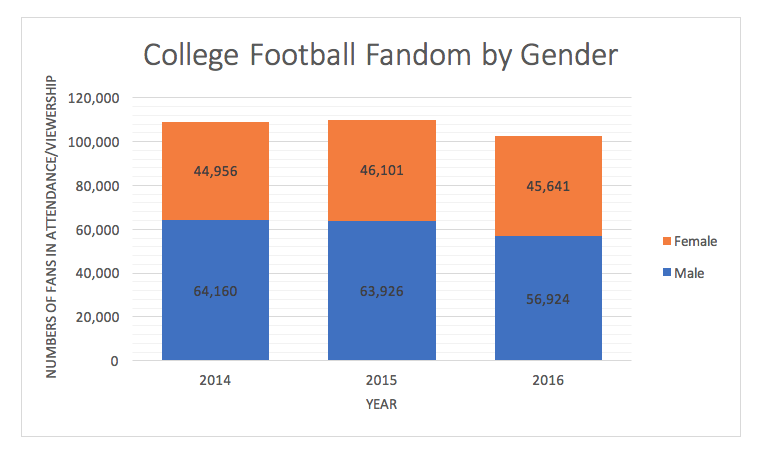 While the total size of the football fandom will likely fluctuate more in coming years, both markets of college football and NFL football have more consistent female audiences than male audiences. Not only are they steadfast, but these consistent ladies have been leaning the percentage of male/female football fans closer to 50/50, generally increasing in number despite occasional setbacks, such as the one between 2015 and 2016. A market of growing and dedicated female fans is certainly promising for the NFL, but a growing female audience may point towards many wanting to see the creation of a female football league in order to represent the growing female fandom. In the summer of this past year, sports business news outlets were swarming with stories of Becca Longo, “the first female to earn a football scholarship to a Division I or Division II school when she signed with D-II Adams State in Alamosa, Colorado,” according to Lars Anderson (@LarsAnderson71). Longo’s kicking leg is legendary from her experience playing in high school, and her hopes for the future include playing in the NFL. Football’s popularity continues to grow worldwide, and the status quo of football is being reviewed every day, from political protests to player safety. In this season of change, there are some big reasons why women’s football should be a league of its own. This blog post was written by Samford University student Sydney Berry. Anderson, Lars. Is This the NFL’s First Female Player? (2017). Bleacher Report, Inc. Retrieved December 12, 2017 from http://bleacherreport.com/articles/2715385-nfl-first-female-player-becca-longo-kicker. Football: College Football Fan Market Summary. (2016). SBRNet. Retrieved December 12, 2017 from http://sportsmarketanalytics.com.ezproxy.samford.edu/research.aspx?subrid=723. Football: NFL Fan Market Summary. (2016). SBRNet. Retrieved December 12, 2017 from http://sportsmarketanalytics.com.ezproxy.samford.edu/research.aspx?subrid=722. Lewis, Russell. U.S. Women’s Basketball Team Dominates Olympic Competition. (2016). National Public Radio, Inc. Retrieved December 12, 2017 from https://www.npr.org/2016/08/18/490449988/the-dominant-u-s-women-s-basketball-team-meets-france-in-the-semifinals. Ourand, John. Women Staying Tuned to NFL. (2014). Sports Business Journal. Retrieved December 12, 2017 from http://www.sportsbusinessdaily.com/Journal/Issues/2014/11/17/Media/NFL-women.aspx. Why Women Play Football. (2017). D.C. Divas. Retrieved December 12, 2017 from http://dcdivas.com/tryouts/why-women-play-football/. WNBA History/Timeline. (2012). WNBA. Retrieved December 12, 2017 from http://www.wnba.com/archive/wnba/about_us/wnba_history_timeline_2012_04_30.html.